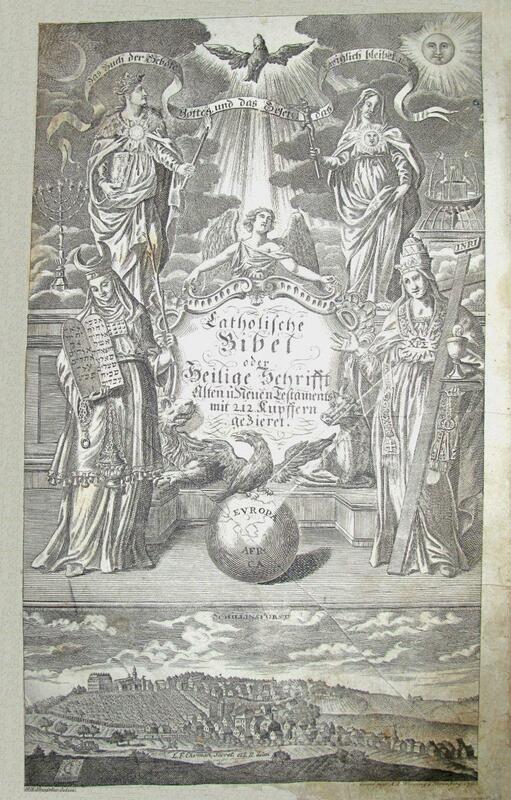 Contents: Roman Catholic translation of the Bible by Dietenberger, a Dominican priest. Bible both Old and New Testament / diligently / faithfully and Christian / according to the old translations handed down in Christian Churches / with interpretation of several dark places / and improvement of many confused words and passages / uncovered and seen in other lately out-of-print German Bibles / By Johann Dietenberger / newly translated into German / To God's eternal Glory / and Welfare of His Holy Christian Churches. 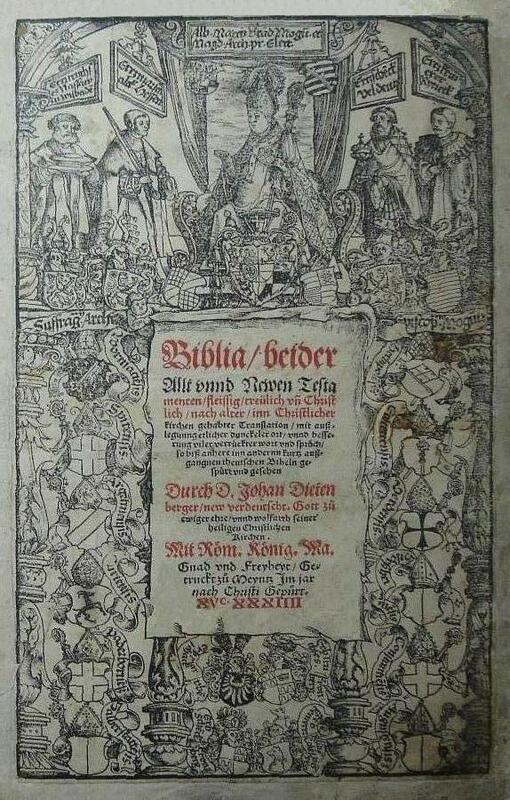 With Roman Royal Majesty's Favour and Privilege, Printed in Meyntz in the year XVcXXXIIII after Christ's birth. 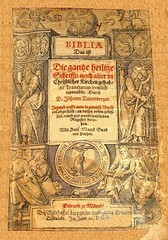 Title: Biblia / das iſt / Die gantze heilige / Schrifft: nach alter in Chriſtlicher kirchen gehab- / ter Translation trewlich / verteutſcht. Durch / D. Johann Dietenberger. / Jetzund auffs new in gewiſſe Verſi - / cul abgetheilt / an vielen orten gebeſ / ſert unnd mit einem nützlichen / R e g i ſ t e r verse / hen. / Mit Kayſ[erlich] Majeſt[ätischer] Gnad / und Freyheit. / ⨳ Haurietis aquas de fontibus Saluatoris ⨳ Iſa. 12. / Getruckt zu Mayntz / Bey Balthaſar Lippen in verlegung Arnold / Quentels. Im Jahr M. DC. IX. 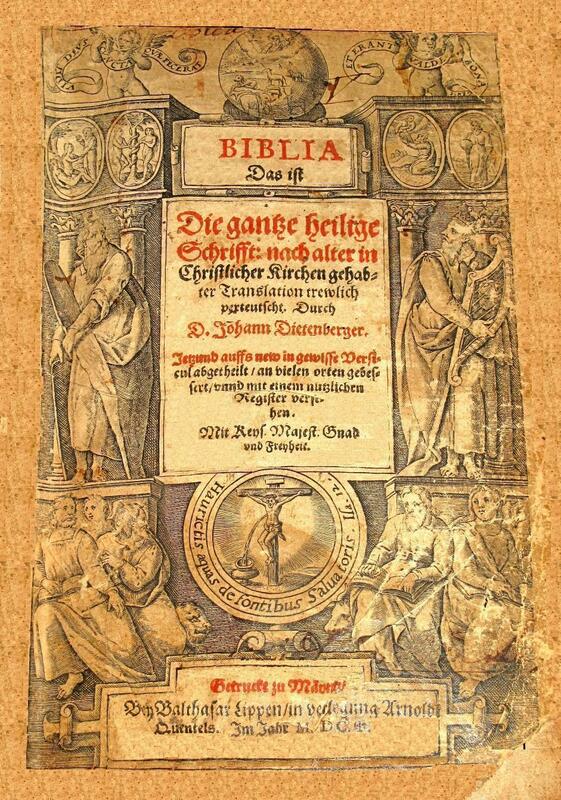 Bible that is The complete Holy Scriptures: according to the old translations handed / down in Christian churches faithfully / translated into German. By D. Johann Dietenberger. Now and anew separated in fixed Ver / ses improved in many places and provided with a useful Register. Printed in Meyntz / At Balathazar Lippen['s printing office] published by Arnold Quentel. In the year 1609. Bible / that is all books of the Old and New Testa / ment according to the old translations handed / down in Christian churches, faithfully / translated into German, illuminated with many beneficial annotations, / By D. Johan Dietenberger / now corrected and improved in many places / adorned with beautiful and elaborate figures, and more diligent / than ever before published. / Printed in Cologne / by Arnoldum Quentin, in the year 1618 / With Roman Imp[erial] Majest[ic] renewed Favour and Privilege. Title: Sacra Biblia. 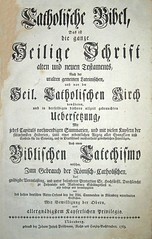 / das ist: / Die gantze / Heilige Schrifft / Altes und Neues Testaments / Nach alter / in Christlicher Kirchen gehabter Translation / treulich verteutscht / Durch / D. Johann Dietenberger / Anjego auss neue in gewisse Dersiculn eingecheiset an biesen / Orten gebessert und mit einem nutzlichen Register / Wirtzburg / Gebrudt ben Johann Michael Klernen Universitate Buchdrudern. / Nurnburg und Fankfurt / Zu finden ben Johann Christoph Lochnern Buchhändlern. / In Jahr Christi M.DCC.V. 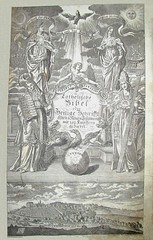 Publisher: Wirtzburg, ben Johann Michael Klernen Universitate Buchdrudern & Nurnburg und Fankfurt Zu finden ben Johann Christoph Lochnern Buchhändlern. 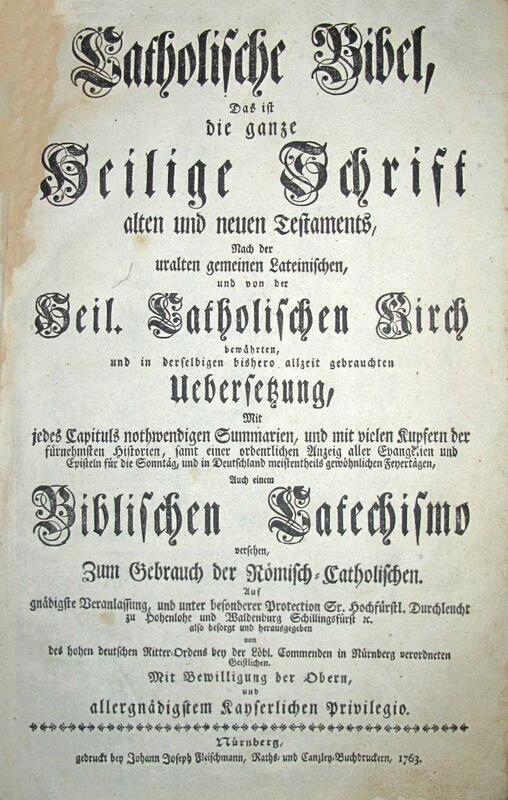 Catholiſche / Bibel / oder / Heilige Schrift / Alten u. Neuen Teſtaments / mit 212 kupfern / gezieret. / Zum Gebrauch der Römiſch=Catholiſchen. Mit Bewilligung der Obern, / und / allergnädigſtem Kayſerlichen Privilegio. / Nürnberg, / gedruckt bey Johann Joſeph Fleiſchmann, Raths= und Kanzley=Buchdruckern, 1763. 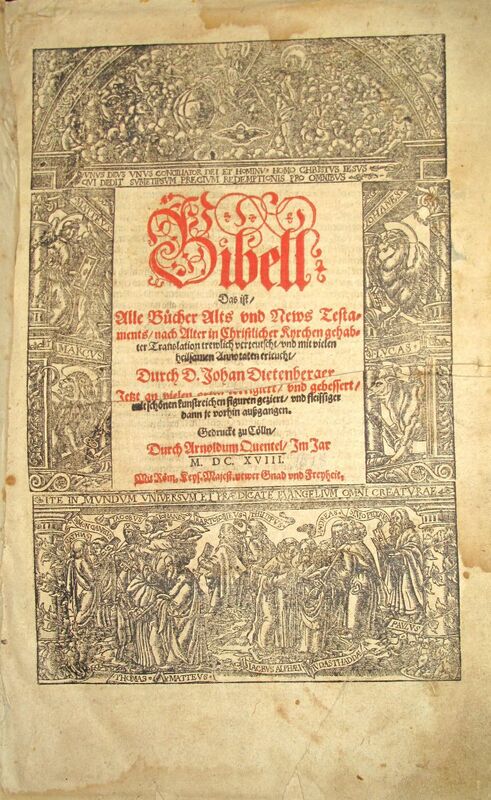 Contents The Bible in the Dietenberger Version, revised by Caspar Ulenberg and again revised by Theological scholars at Mainz, originally published in 1630 at Cologne, and sometimes referred to as the "Catholic Bible of Mainz." 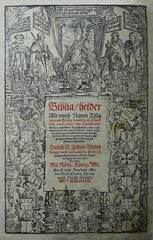 Comments This particular reprint is known as the "Lottery Bible," or, "Hohenlohesche Bible" since it is believed to have been printed for a lottery. It includes a 98-page Catechism. Catholic Bible or Holy Scriptures of the Old & New Testament, decorated with 212 copper[engraving]s.
To be used by Roman=Catholics. With allowance of the Supreme, and most gracious Imp[erial] Privilege.